After a long hiatus from Mission hopping (our last excursion was to Mission San Buenaventura in Ventura back in 2012), we decided to take a week off to hit the next three on our list up along the Central Coast. Since our fur babies, Addy and Sasha, were currently doing board-and-train with their trainer, this made it so much easier for us to travel to these non dog-friendly locales. Santa Maria was to be our hub, so en route, we made our first stop at Mission Santa Ines on the eastern edge of the town of Solvang. We left home about 9am, with a quick stop at Starbucks in Wildomar to pick up some lattes and breakfast. Traffic was pretty smooth since we bypassed the early Monday morning rush hour and managed to arrive at the mission, 227 miles later, at 1:45pm. 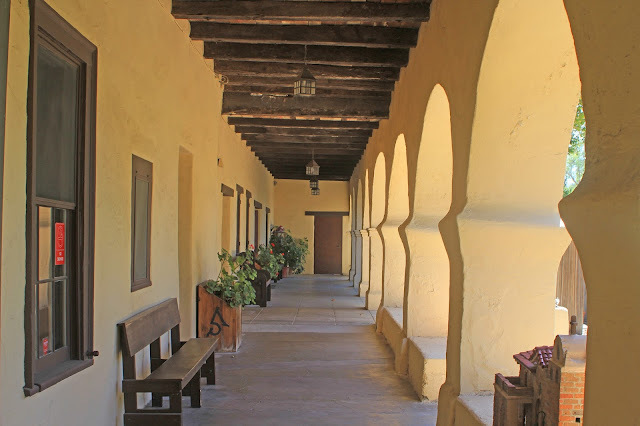 7/27/15 Entrance to the Mission Church and Bell wall. 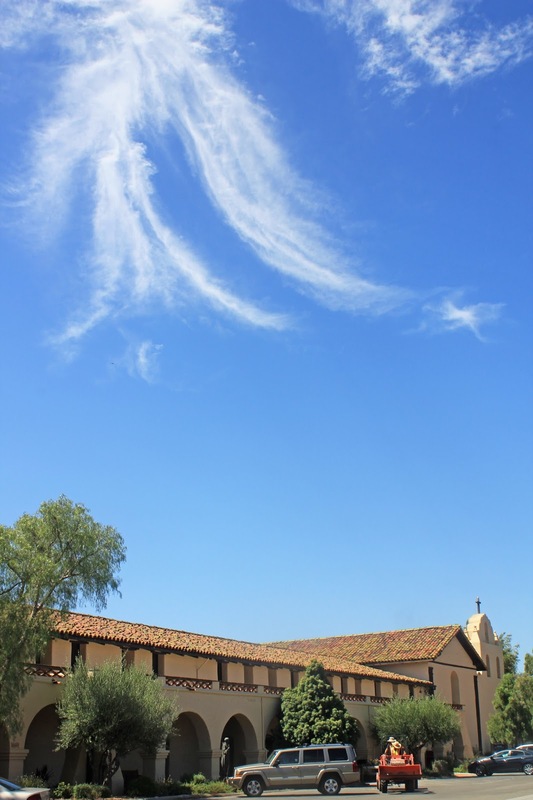 "The bells of Santa Ines have rung out across the valley since September 17, 1804. On that day a cross was planted and the bell was suspended from a neighboring oak tree. The Missions first bell site was destroyed by the earthquake of 1812. 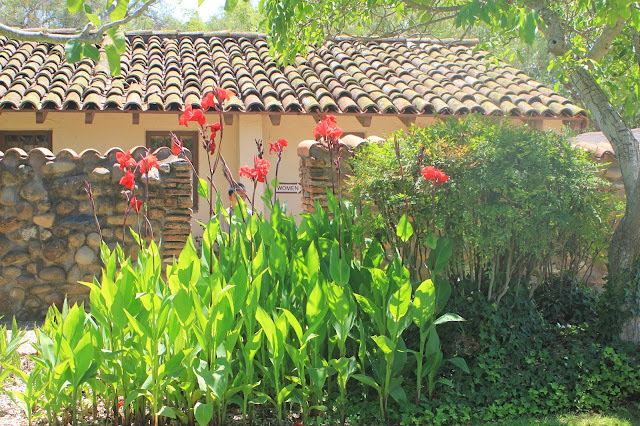 During 1814 to 1816, a large adobe wall was constructed to hold three bells. New bells were cast in Lima, Peru, and the formal dedication took place on July 4, 1817. The bell wall lasted until 1911 when a huge rainstorm literally melted it. 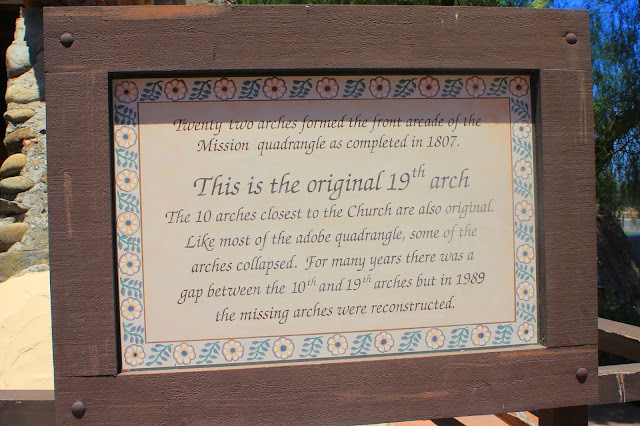 When Father Buckler had it rebuilt the following year, a third bell arch was added. Still hanging in the top arch of the bell wall is the 1818 Lima bell, which was recast in 1953. 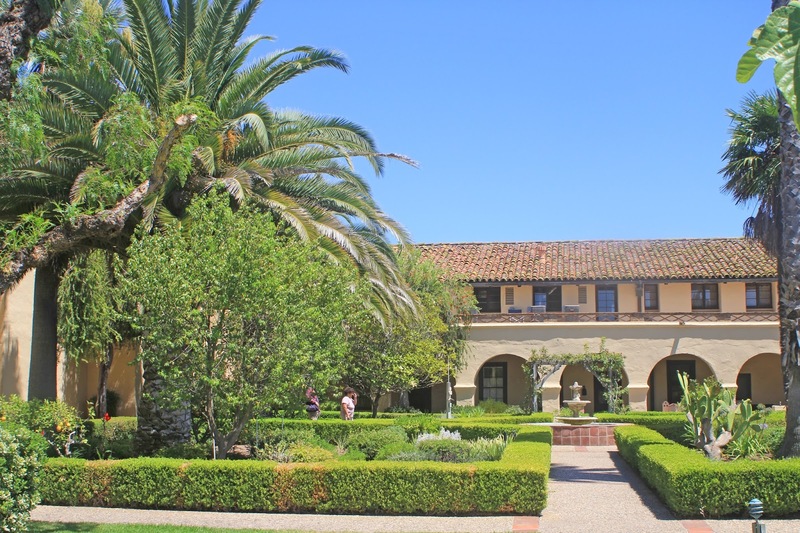 The 1912 St. Agnes bell was used for the dedication of the new tower that same year. 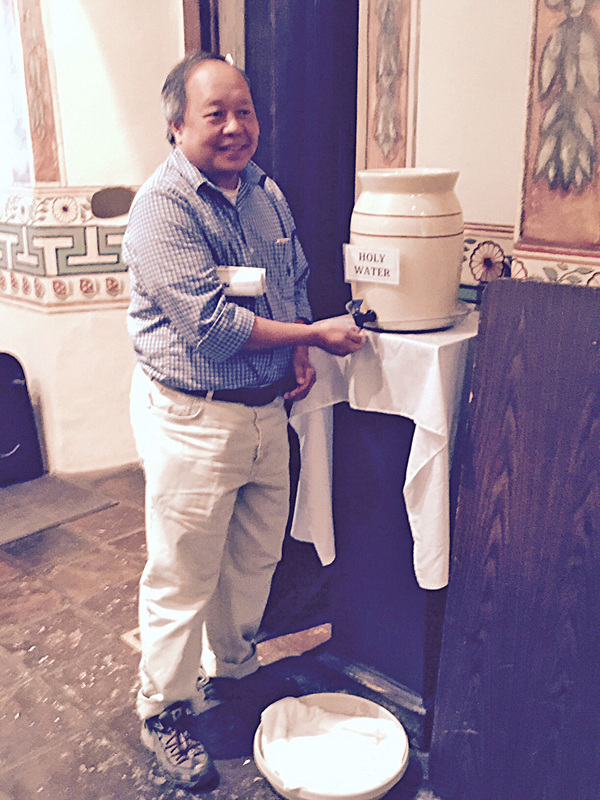 Two new bells were dedicated in 1984." 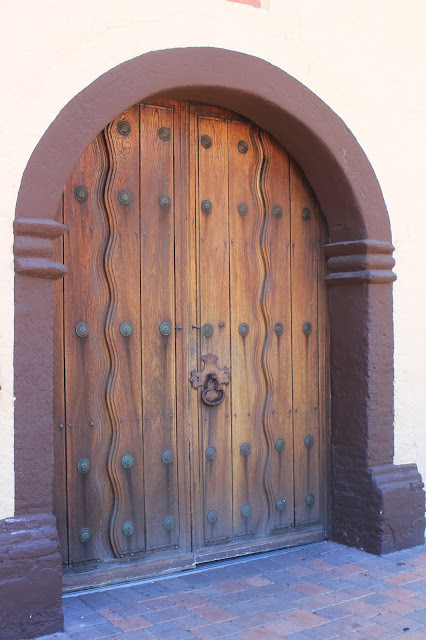 Entry door to the Church. 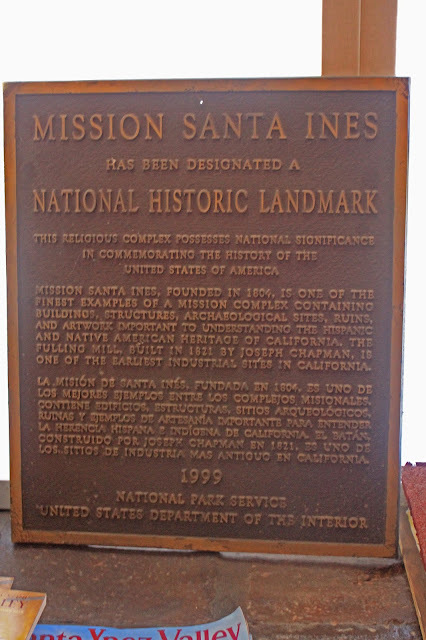 Monument at the entry to the Mission grounds. Cross near the Rose Garden. Gil, looking giddy, at the Mission Rose Garden. 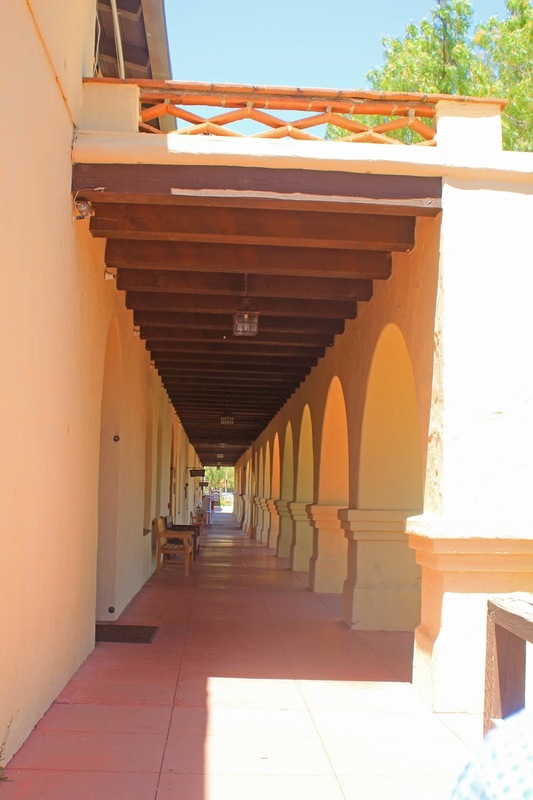 The restored arched colonnade at the front of the mission. Arched colonnade at the front of the mission. 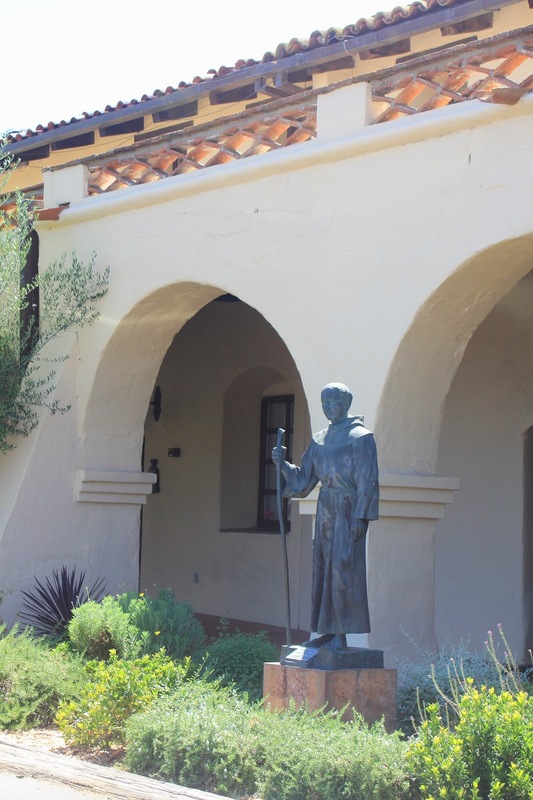 Statue of Fray Serra at the front of the mission. Beautiful view of the Santa Ynez Valley from the parking lot. 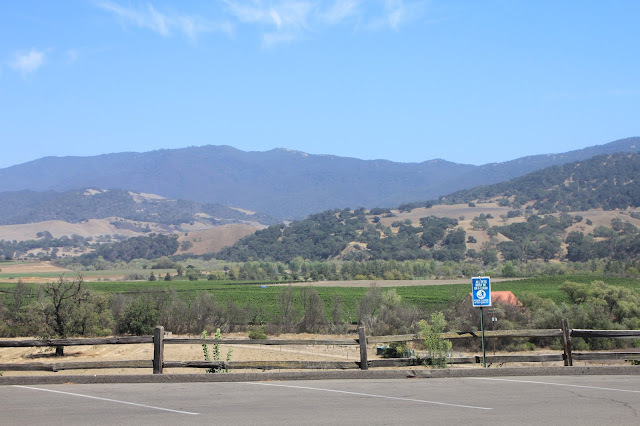 Another view of the Santa Ynez Valley from the parking lot. 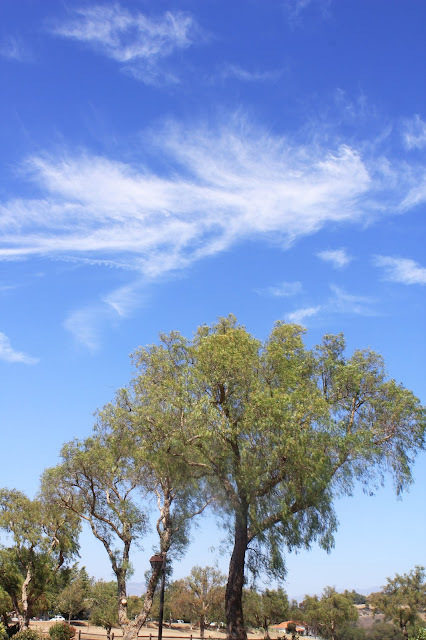 Pepper trees in the parking lot. Madonna Chapel. 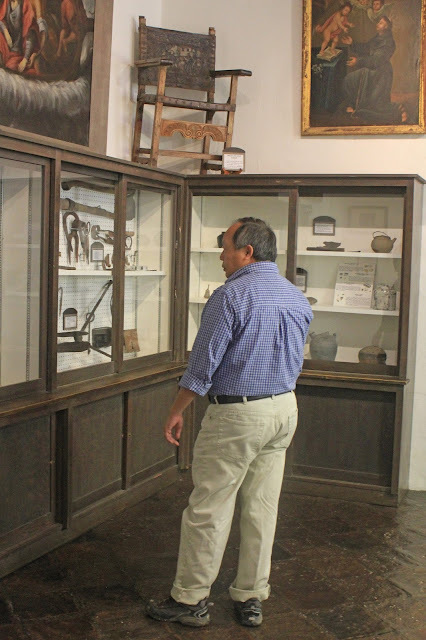 From the plaque: "Polychrome wood; 18th Century Mexican; carved from a block of wood; garments are real cloth dipped in gesso and then separately carved; real teeth were set in." 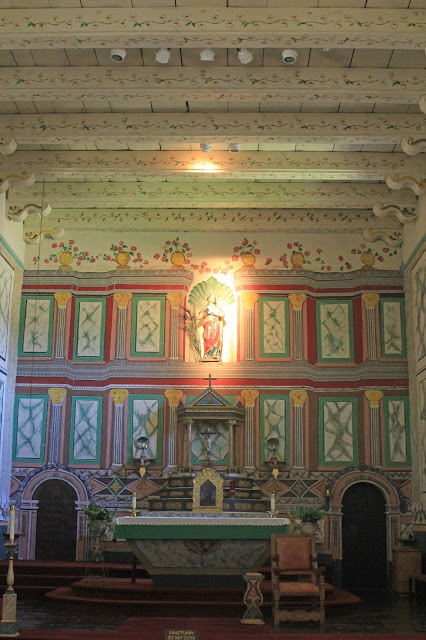 The Mission Chapel. This is apparently the only building here that has remained unchanged since the devastating 1812 earthquake. 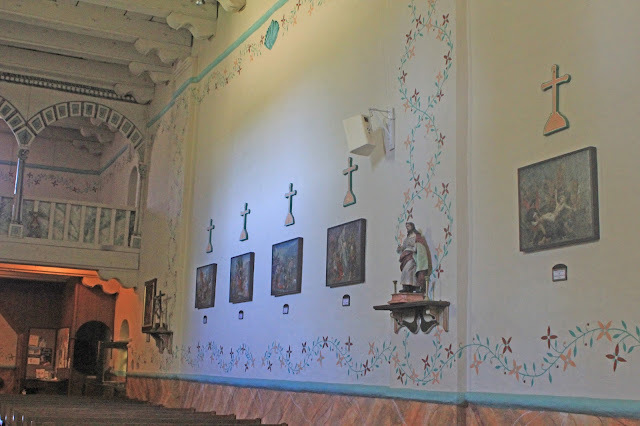 The fourteen Stations of the Cross on the Chapel walls were copied from a series in the Church of Santa Maria del Giglio in Venice, Italy. 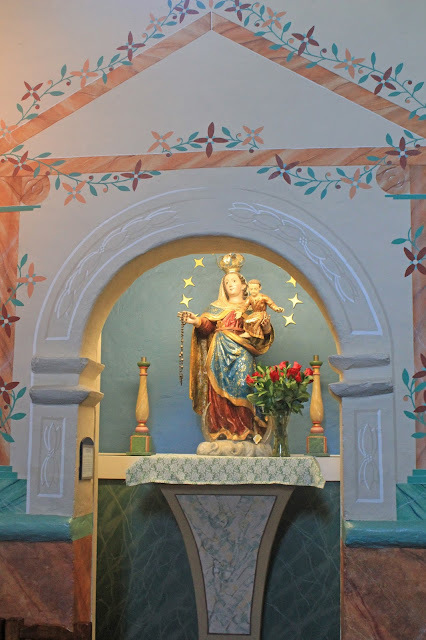 ROSARIO - Our Lady of the Rosary. 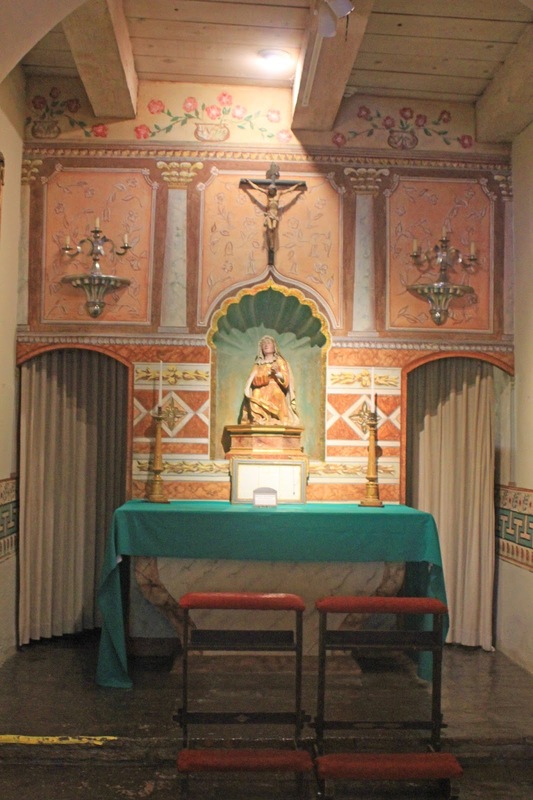 In the Mission Chapel. 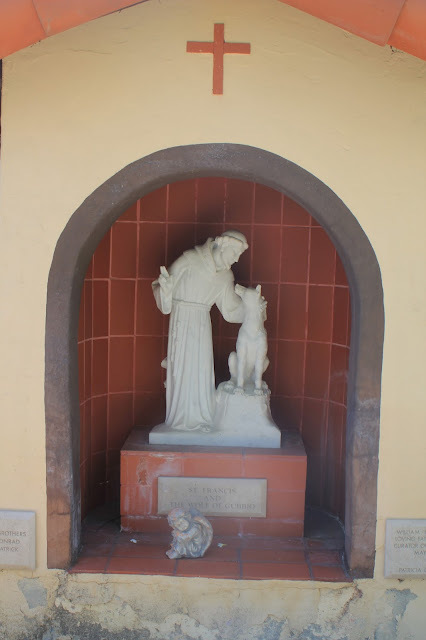 From the plaque: "Middle 18th Century Mexican Baroque sculpture. Polychrome wood; estofado - a technique by which the entire figure is gilded, over-painted and then engraved to reveal the underlying gold leaf. The technique produces a quilted effect on the clothing. 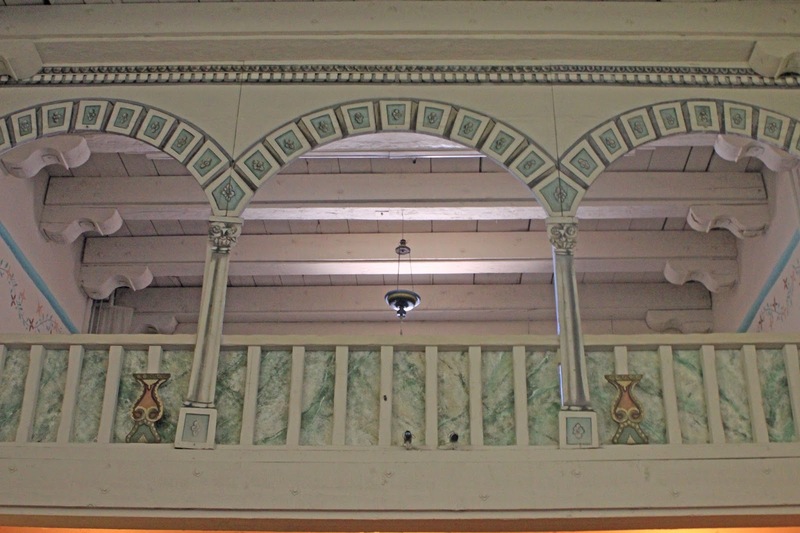 Restored in 2007." 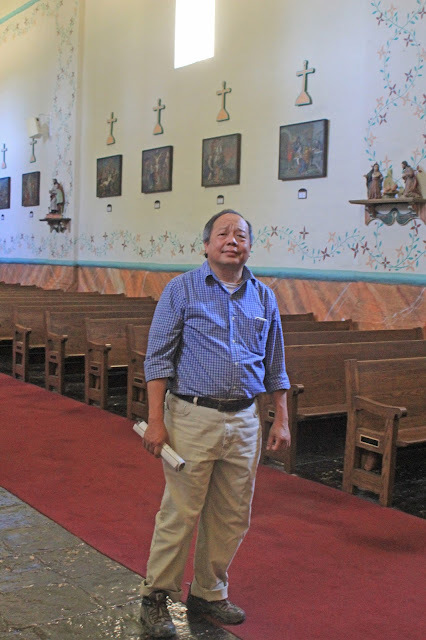 Gil, looking perplexed, in the Mission Chapel. Five of the fourteen Stations of the Cross paintings in the Mission Chapel. 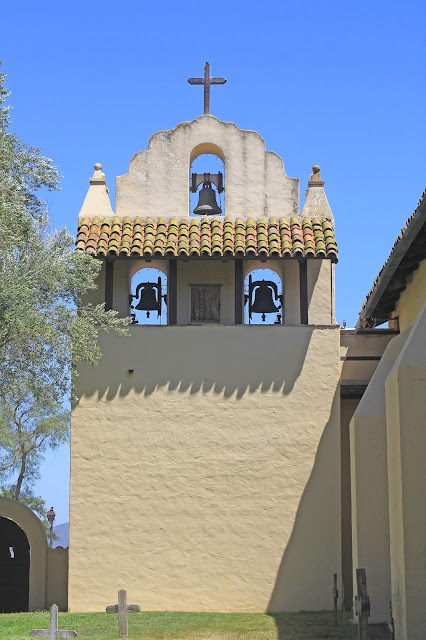 Mission bells. 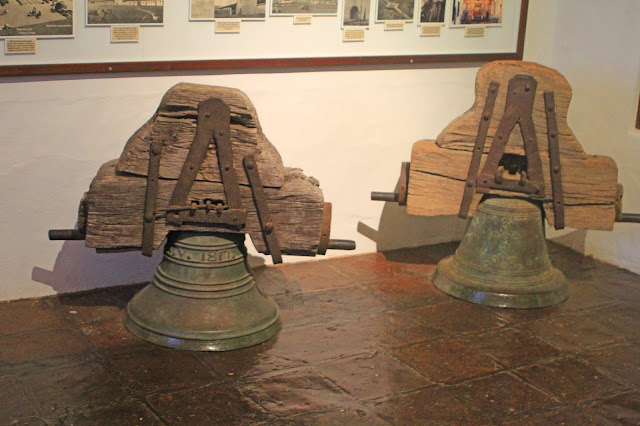 Four bells are displayed in the Mission Museum. The oldest is the 1804 Juan Baptisia bell. 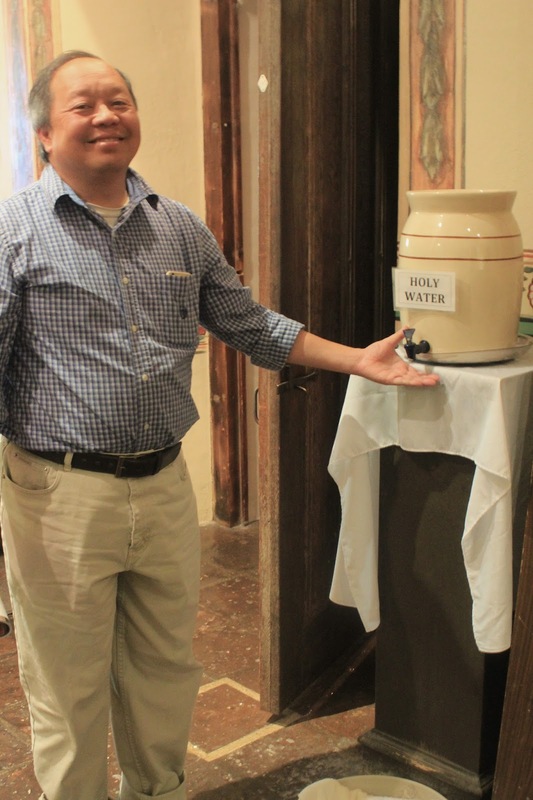 The Ave Maria Purissima bell was cast in 1807, and the bell from Lima, Peru, was cast in 1817. The Martyrdom of Santa Ines. Oil on canvas; late 17th century Mexican. 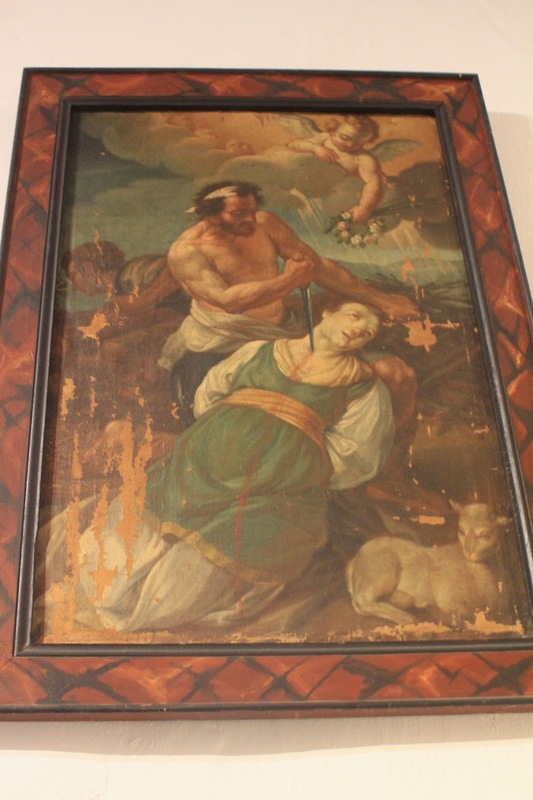 Oil on canvas; signed by Andres Lopez, Mexico, 1803. From Mission Santa Ines: The Hidden Gem: "Saint Agnes (Santa Ines) was a beautiful young Roman girl who had accepted Christianity early in life. 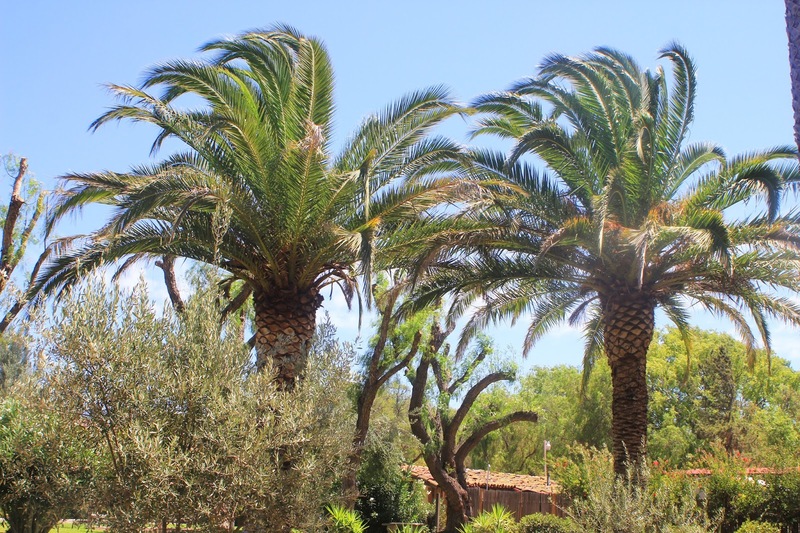 When the son of a Roman governor sought her as his wife, she refused, stating that she was already betrothed - as she had dedicated her life and heart to Jesus. 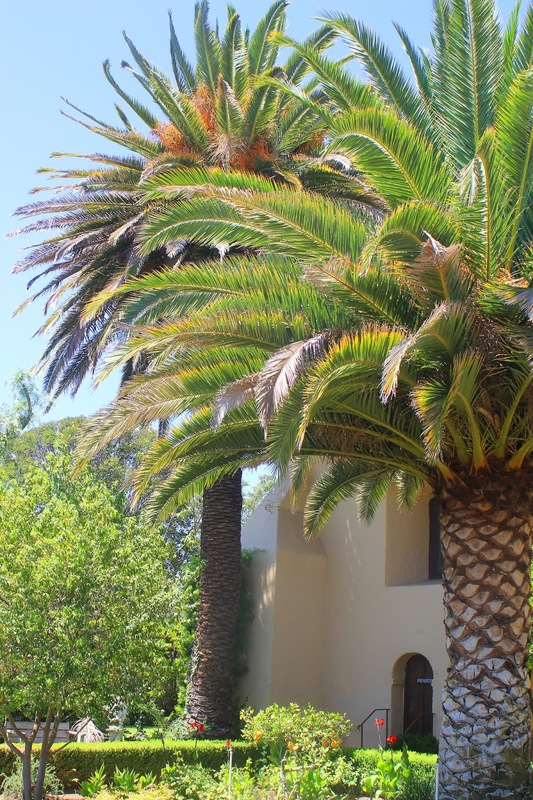 Furious at discovering her Christian faith, the Roman official commanded that she be forced to become a temple prostitute for the Roman pagan religion and had her taken to a brothel where she was stripped. According to legend, her hair grew long enough overnight to cover her nakedness and protect her purity. The young man attempted to see her but was blinded; Agnes then prayed for him and his sight was miraculously restored. Because of these events, the people of the time viewed her as a sorceress, and she was brought out to be burned at the stake, but again the Lord protected her and the fire was miraculously extinguished. In 304 AD she was beheaded as a Christian martyr and became one of the best known and most widely honored of the early Roman martyrs. 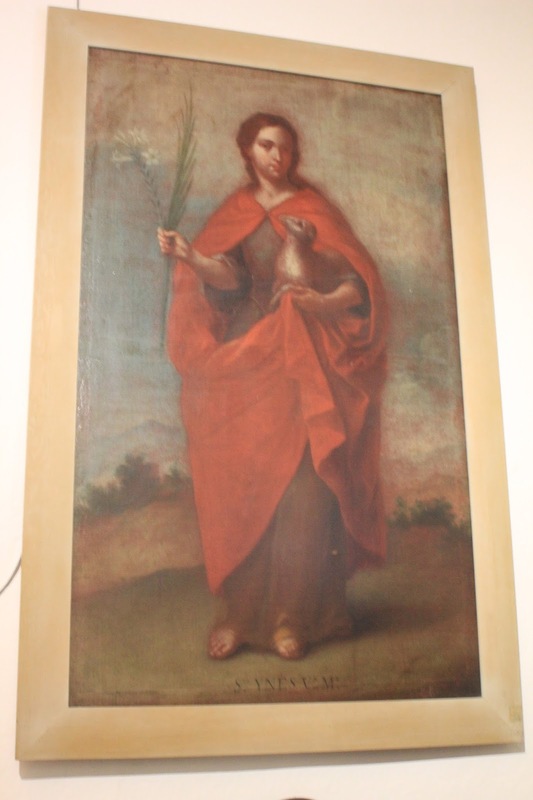 Saint Agnes is the special patroness of bodily purity and chastity." 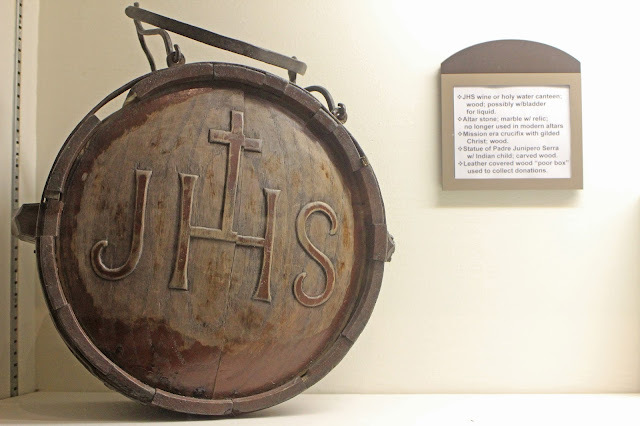 "JHS wine or Holy Water canteen; wood; possibly with bladder for liquid." "Adrulfo Lopez, a Chumash Indian, was hired by the Santa Barbara County in the 1920s to control the squirrel population. 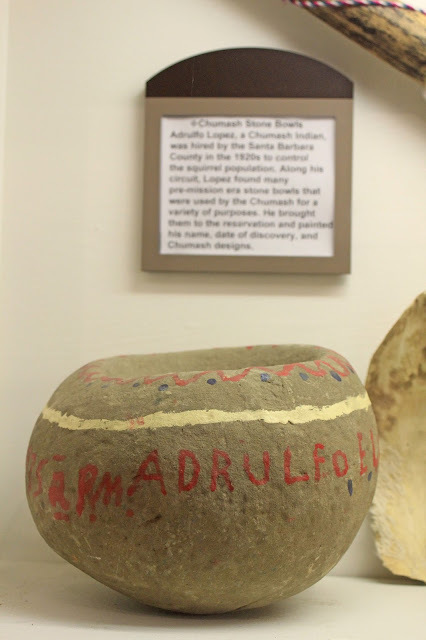 Along his circuit, Lopez found many pre-mission era stone bowls that were used by the Chumash for a variety of purposes. 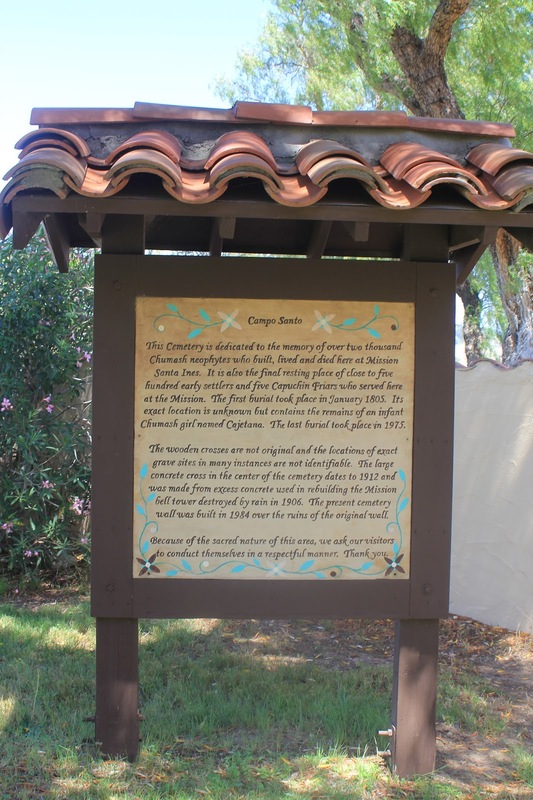 He brought them back to the reservation and painted his name, date of discovery, and Chumash designs." Vestment reputed to have been worn by Fr. Junipero Serra (1713-1784). 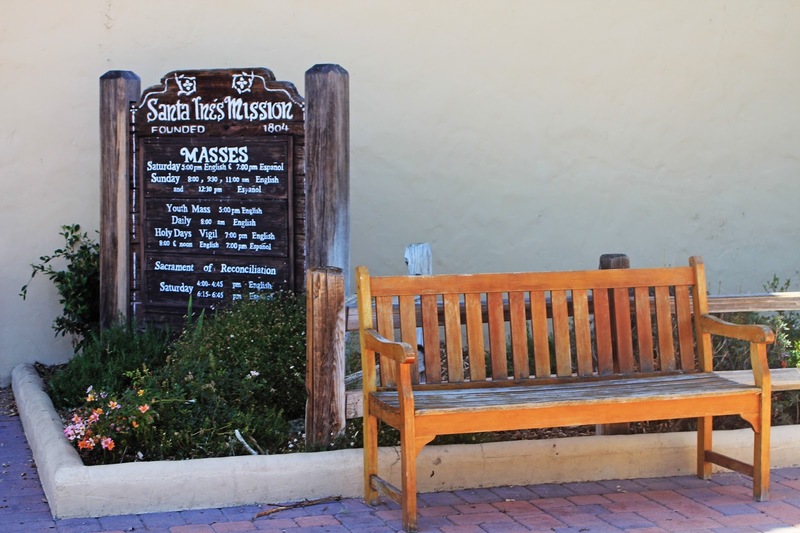 Mission Museum collection. 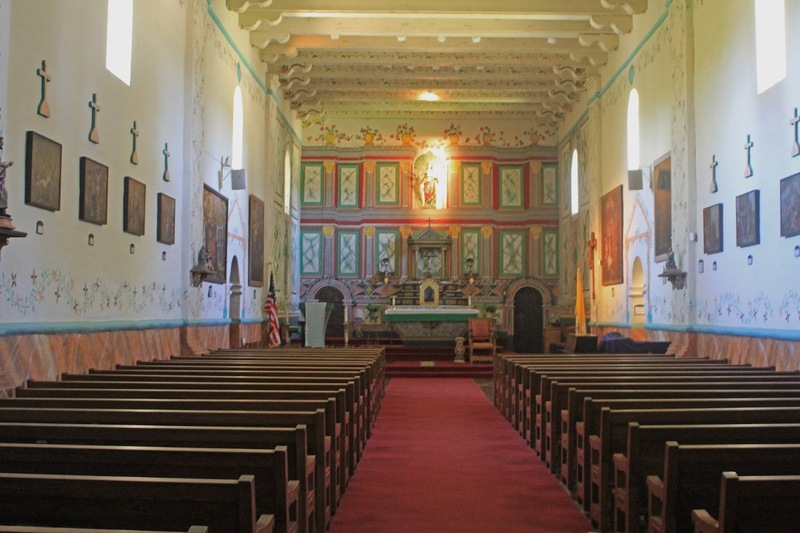 From the booklet Mission Santa Ines: The Hidden Gem: "Mission Santa Ines has the largest and most valuable collection of early California church vestments from the 15th century to 1718, having been the depository for vestments from the earlier successful missions in Baja California and Mexico...The vestments are made from materials such as beautiful oriental silks, with floral designs, satins, damasks, and brocades, which were transformed into Spanish- and Roman-style chasubles. Some have gold or silver flat thread woven into their designs." I know what you're thinking, Gil - DON'T do it - bad, bad!!! By Katherine Donahue. Oil on canvas; early 20th Century American. 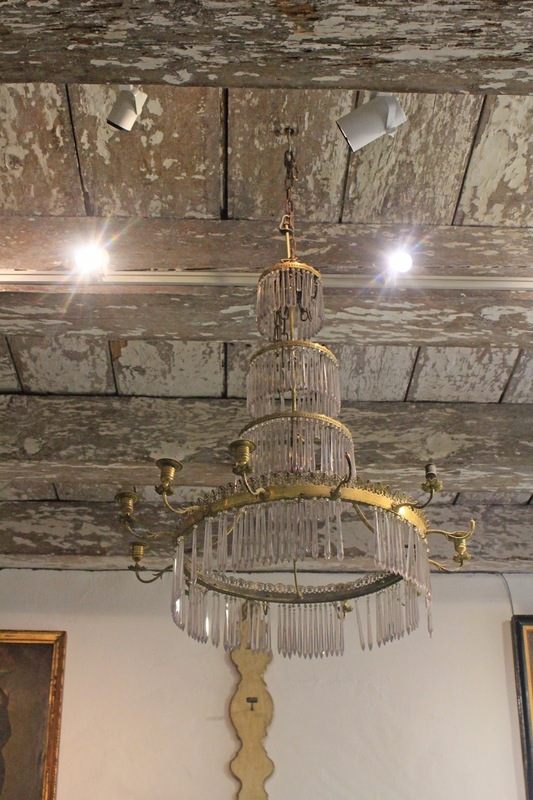 Chandelier in the Mission Museum. Exit from the back of the Mission gift shop/museum to the gardens. 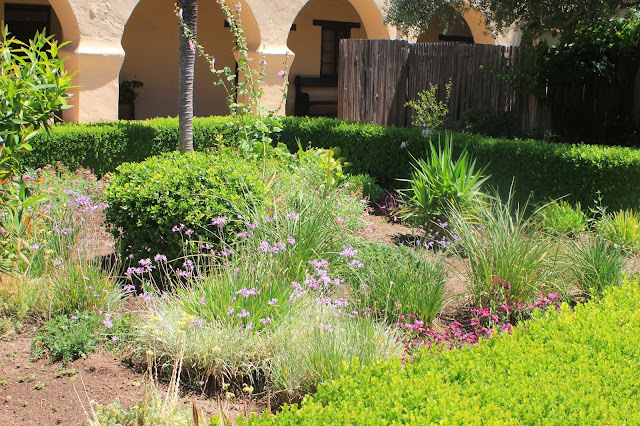 "The expansive garden behind the Mission is a lovely surprise for many visitors. Dating to the Mission's earliest days, the garden has undergone many changes; it currently retains the formal design of a hedge in the shape of a Celtic cross implemented by the Capuchin Franciscans in 1926." 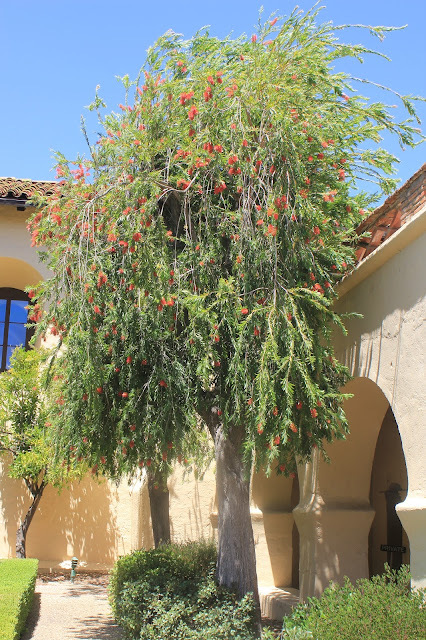 This looks like a bottlebrush tree (Callistemon species), which is native to Australia, but thrives in California's mediterranean climate. 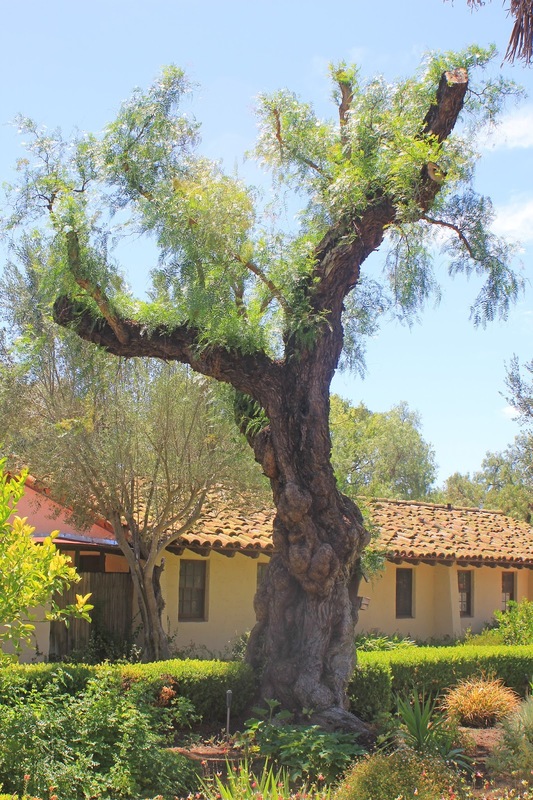 A large, hard-pruned, Pepper Tree. 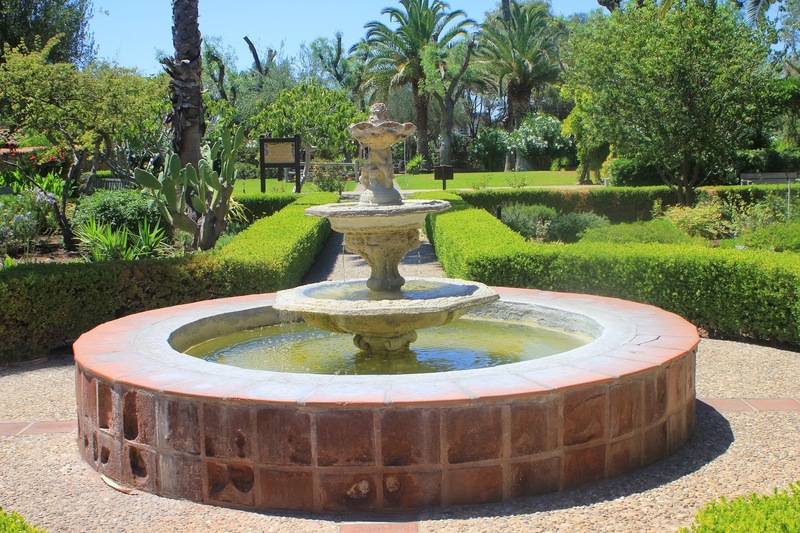 Mission garden. 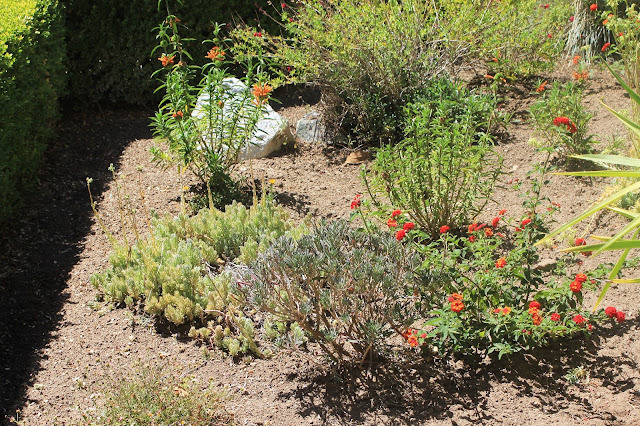 Looks like Scabiosa, Hollyhocks, and some drought tolerant grasses in one of the planting beds. Canna lilies, citrus, mallow, rosemary, and what looks to be a ficus tree on the left. Mission garden. 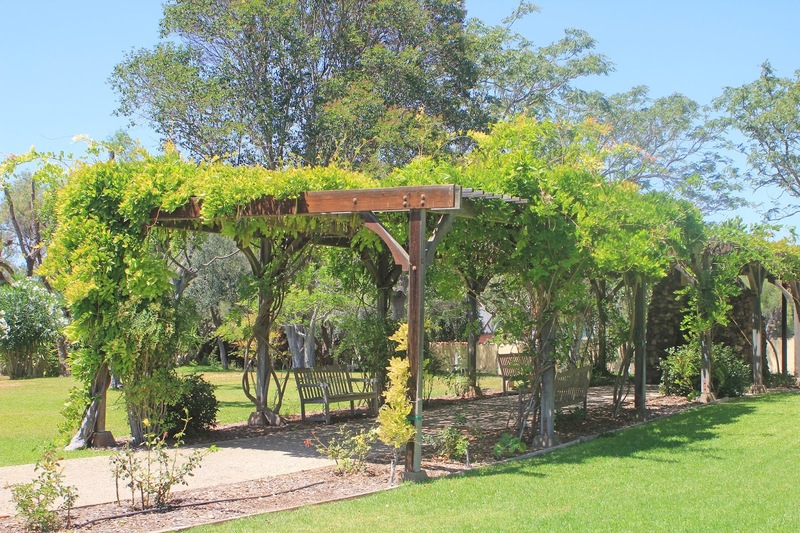 Wisteria arbor and grotto. Mission garden. "I am the Immaculate Conception. In 1858 Our Blessed Mother appeared to Bernadette Soubirous outside of Lourdes, France. Bernadette was directed to the healing waters and told to pray for sinners." Under the Wisteria arbor in the Mission garden. Grotto under the wisteria arbor in the Mission garden. 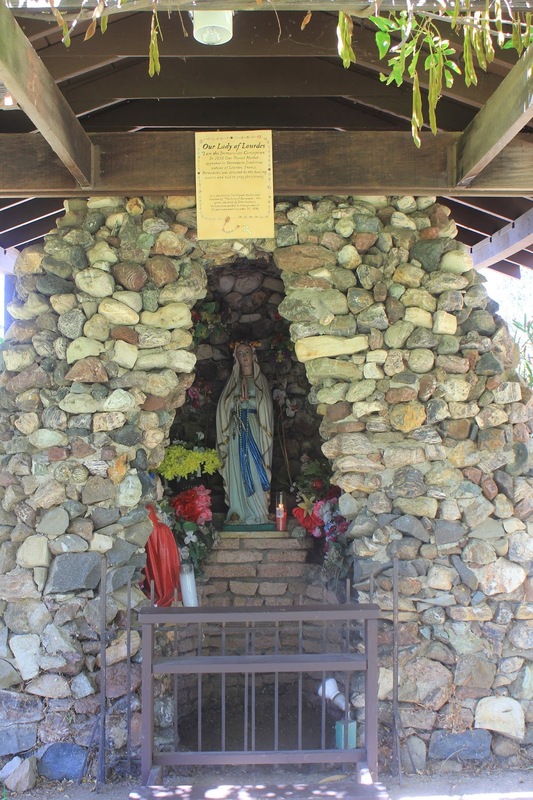 "As a devotion to The Blessed Mother and inspired by 'The Song of Bernadette," this grotto was built by John Gebhardt. 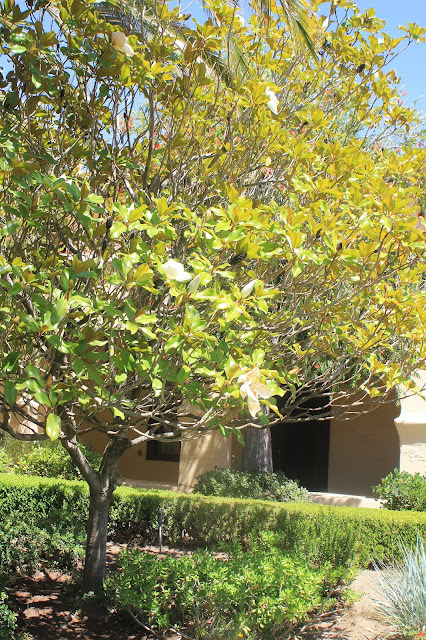 He lived and worked in these gardens for 30 years and died December 15, 1978." 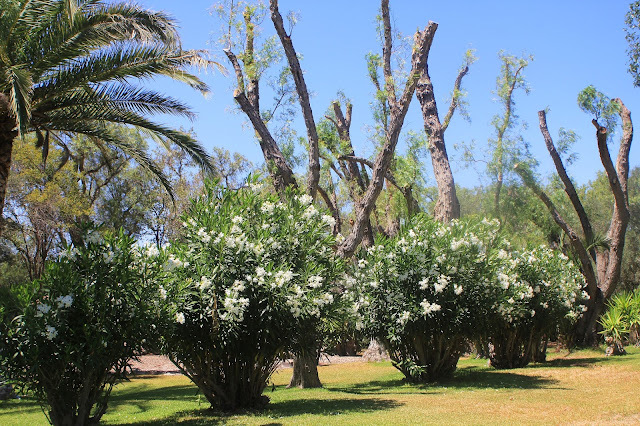 Canary Island Date Palm, white-flowered oleanders, and some heavily pruned Pepper trees in the backdrop. 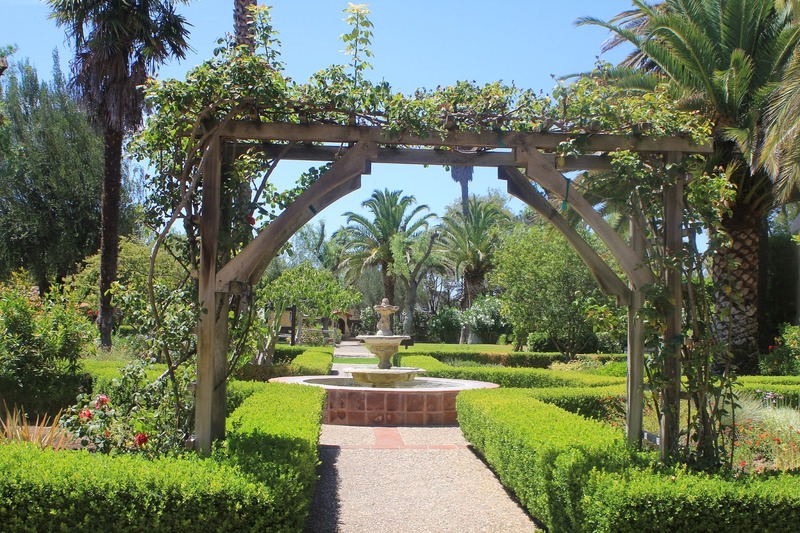 Mission garden. Canary Island Date palms, olive trees and pepper trees. 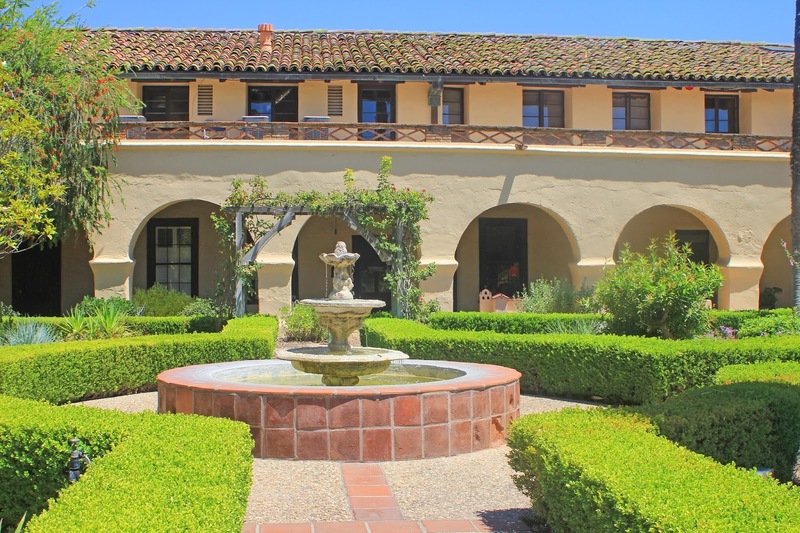 Mission garden. Oooh! A Cal native! 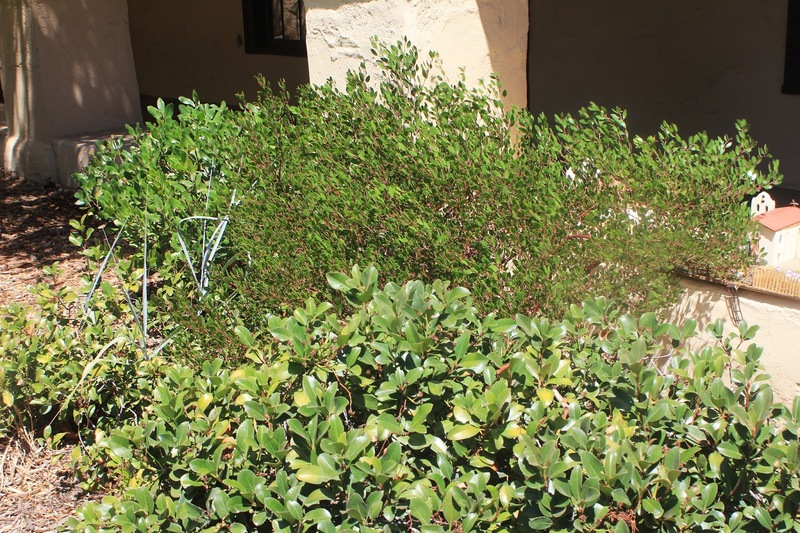 This Manzanita was not labeled, but it looks strikingly like a Howard McMinn (Arctostaphylos densiflora). 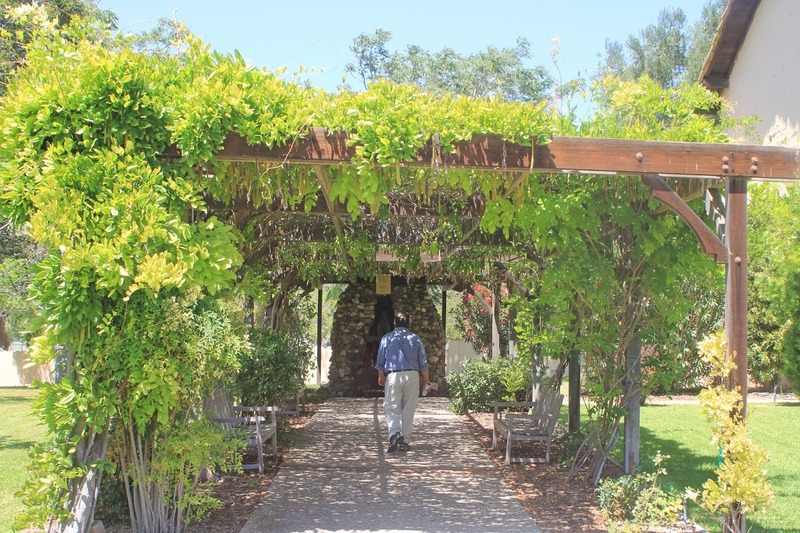 Mission garden. Lion's Tail, Autumn Sage, and Lantana. 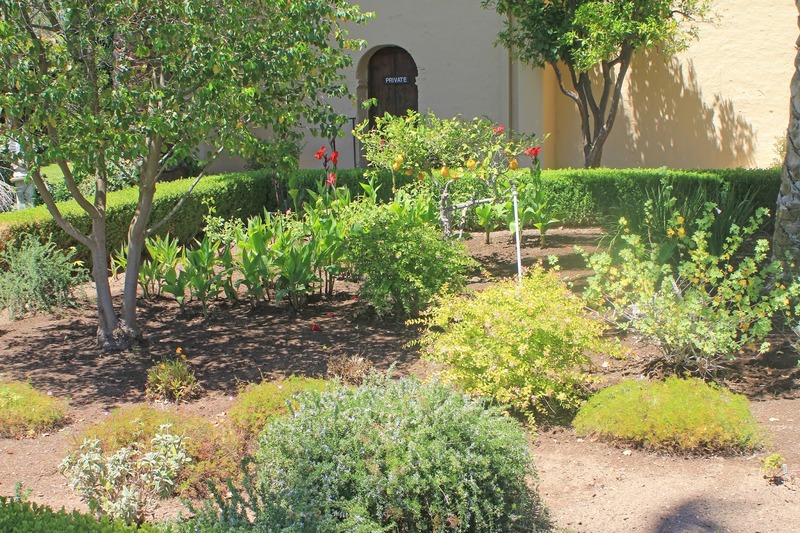 Mission garden. 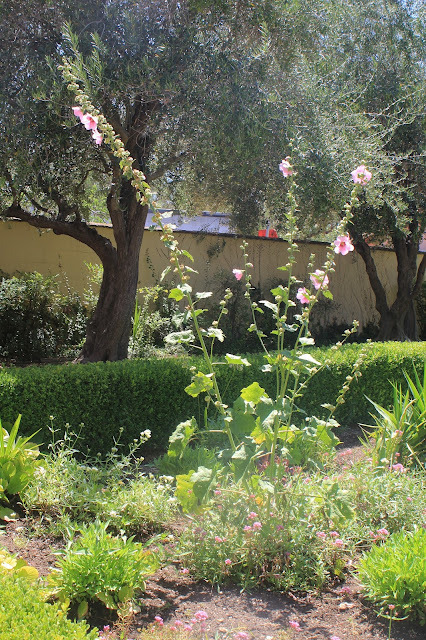 Hollyhocks and both white and red-flowering valerian, with a large olive tree in the background. Mission garden. 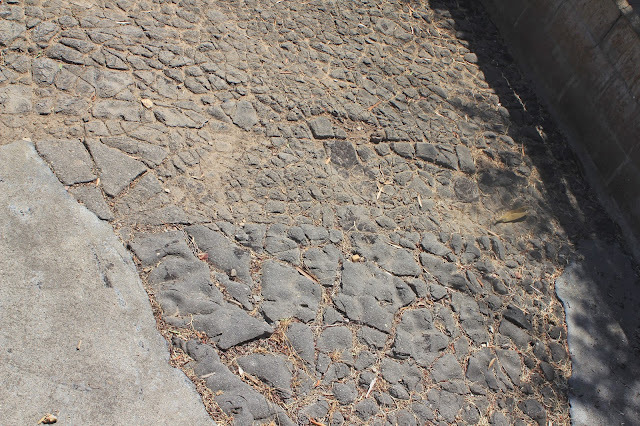 Original asphalt floor of The College of Our Lady of Refuge of Sinners. 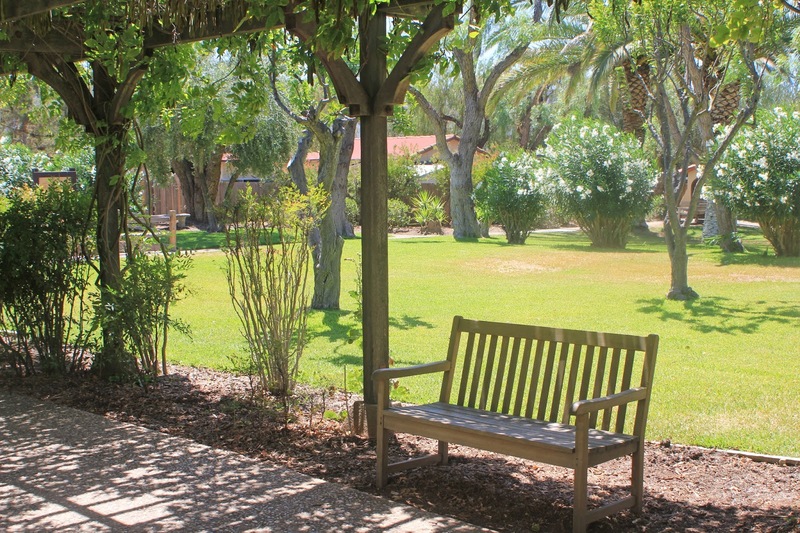 Mission garden grounds. 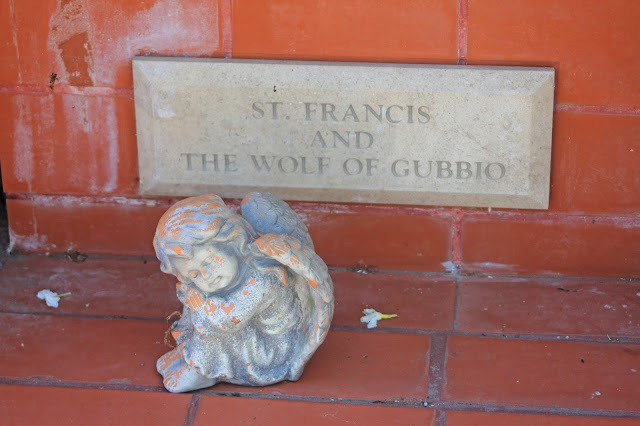 St. Francis and The Wolf of Gubbio. Dedicated to the Capuchin Franciscan Brothers Colmcille, Paschal, Conrad, Alexius, Brendon & Patrick. 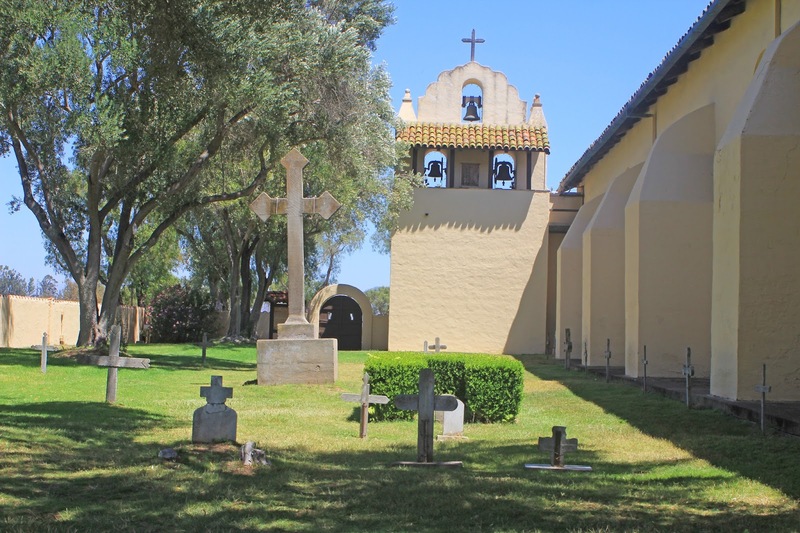 The cemetery is dedicated to the memory of over 2,000 Chumash Indians who lived and died at the mission. It is also the final resting place for over 500 of the early settlers and 5 Capuchin Friars who served at the mission. The first burial took place in 1805 (an infant Chumash girl named Cajetana - actual burial site unknown) and the last in 1975. 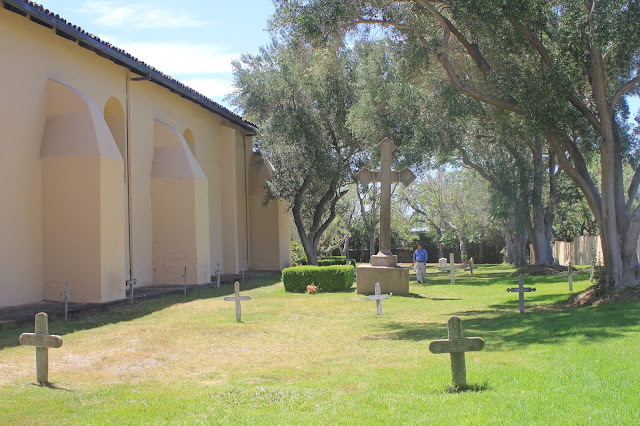 The wooden crosses are not original and many of the grave sites have not been identified. 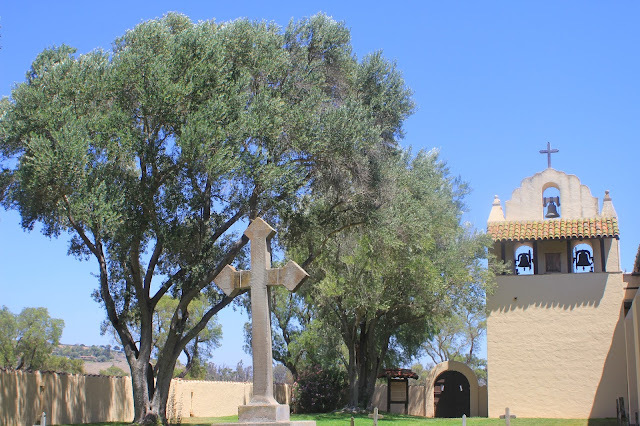 The large concrete cross dates to 1912 and was made from excess concrete used in the rebuilding of the mission bell tower, which was destroyed by rain in 1906. Bell tower as seen from the Campo Santo. Gil, looking pensive, in the Campo Santo. 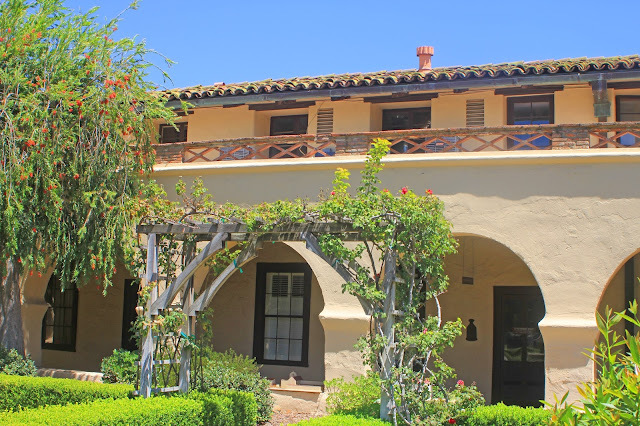 Location: 1760 Mission Drive, Solvang, CA 93464. Northbound or southbound, take Hwy. 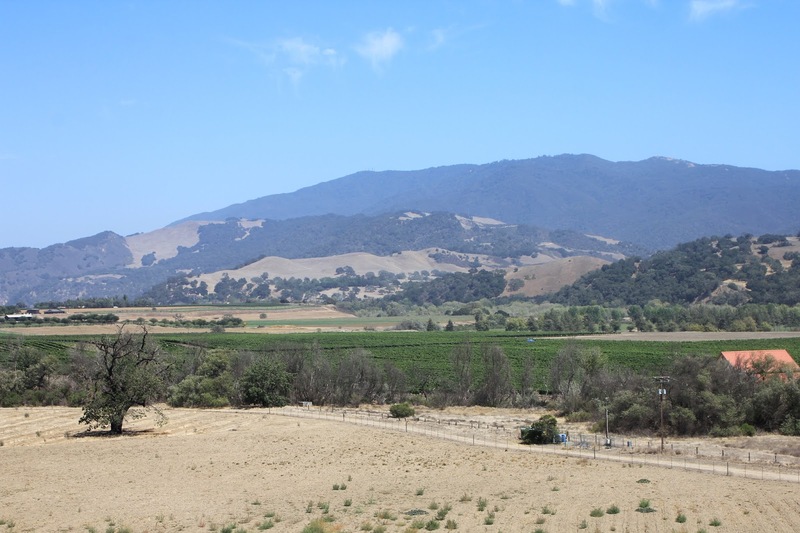 101 to CA 246E towards Solvang/Lompoc. Continue for about 3.5 miles through the town of Solvang until you reach the entrance to the mission. There is ample free parking in the front of the mission. From our home in Murrieta: I-15N - 210W - 134N - 101N. Exit State Street to 154 (go straight and then right on San Marcos Pass Rd.). 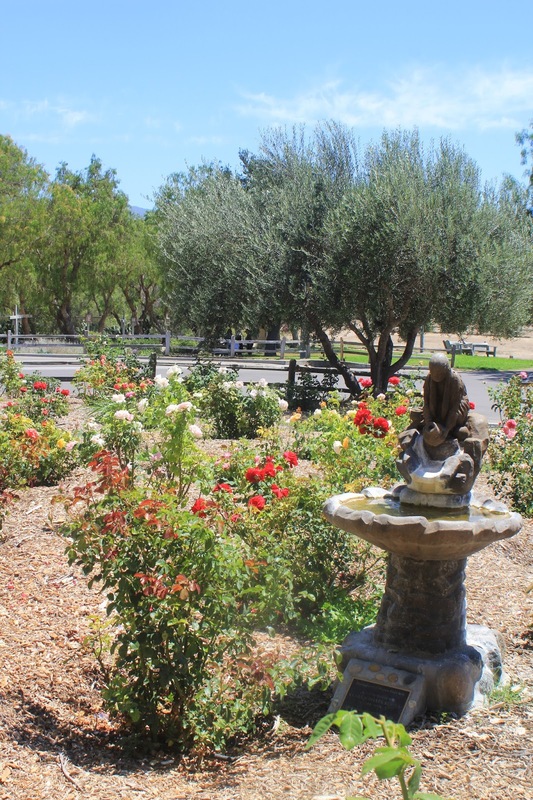 Take CA 246 (Santa Ynez) and drive about 3.5 miles through downtown Solvang. 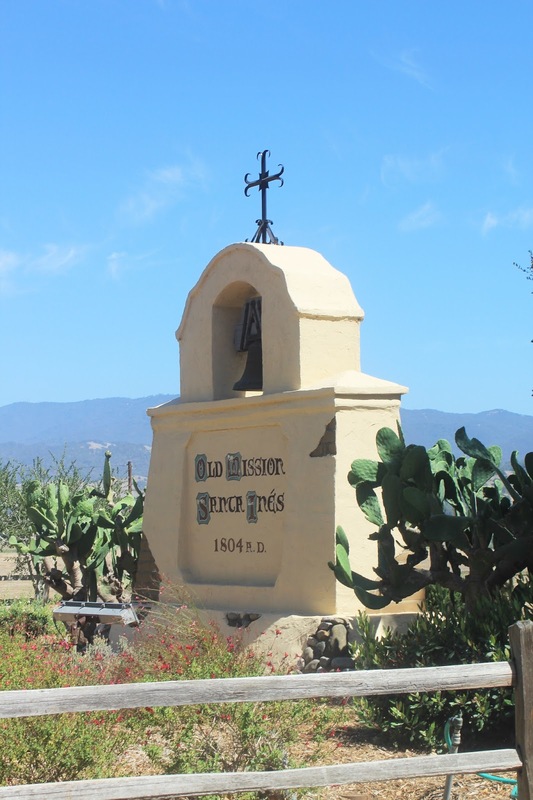 Mission entrance is on the left. Hours: Open daily 9:00am to 5:30pm for self-guided tours (you must go the the Mission Gift Shop to pay for admission and start the tour). The Gift Shop is open the same hours and until 7pm in the summer. The door between the Museum and Church is locked during Masses. Admission Fees: $3 for adults, $2.50 for seniors. Mission Santa Ines is the 19th of 21 California Missions, founded on September 17, 1804. 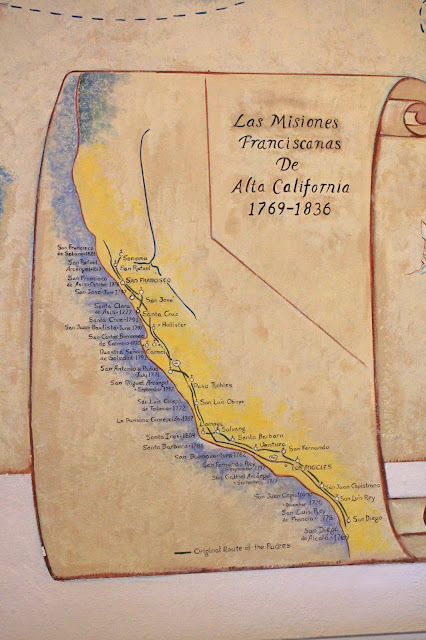 Special Designation: Mission of the Passes (aka the "hidden gem" of the California Mission System). Named For: St. Agnes of Rome, a 13 year old Roman girl martyred in AD 304. Also called "Santa Ines." Indians Joining the Mission: This mission is located in the land of the Chumash people and was initially populated by neophytes from missions Santa Barbara and La Purissima. 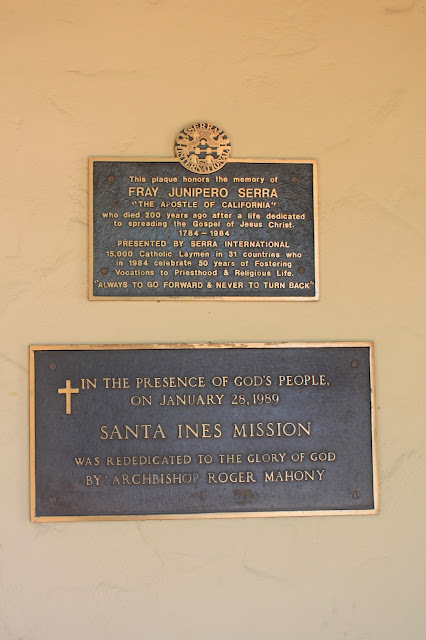 The neophytes at Santa Ines were referred to as Inezeno (after the mission). 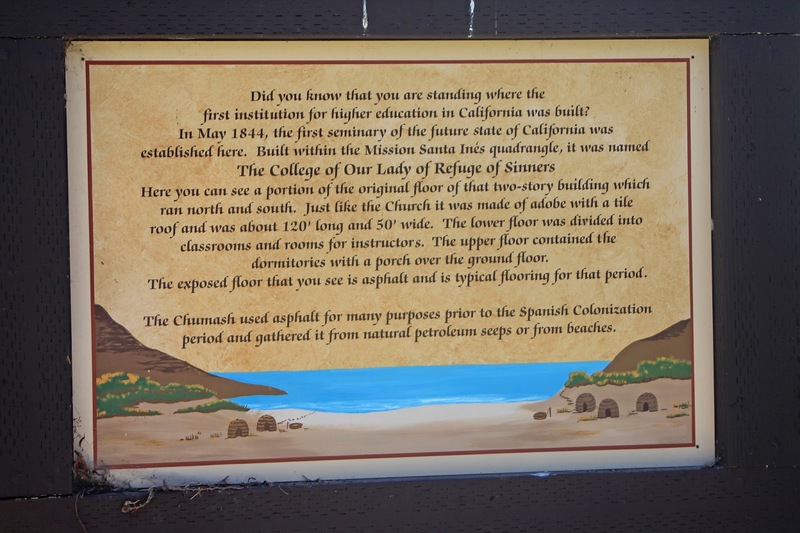 They're one of three distinct linguistic/geographic entities of the Eastern Coastal Chumash. 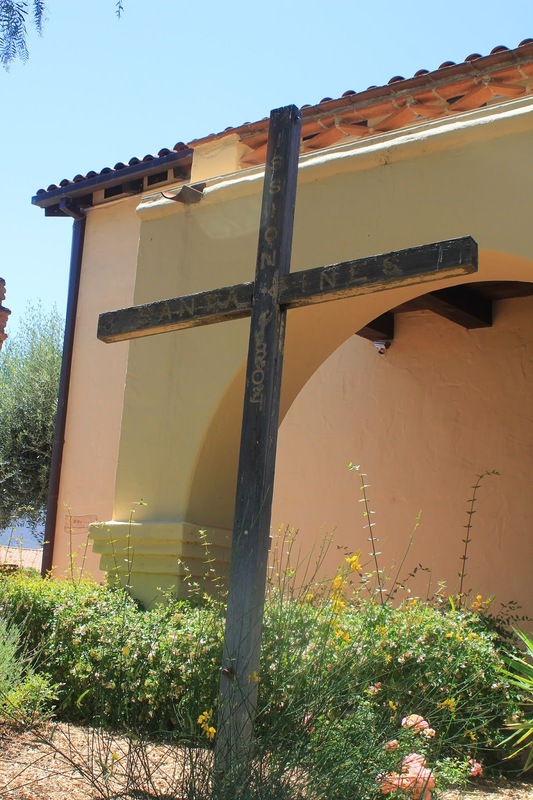 Mission Site: An inland mission, Santa Ines was established near a rancheria, Alajulspu, in the Santa Ynez Valley and sits on its original site. 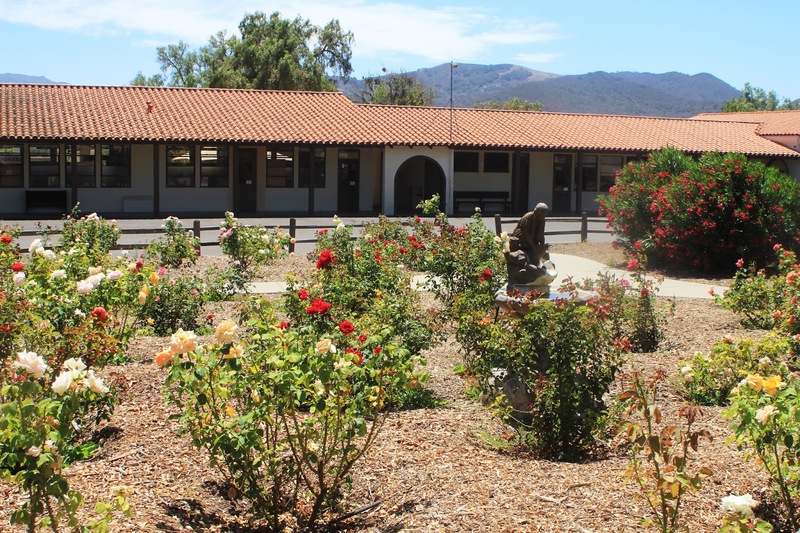 It is on the eastern edge of the town of Solvang, founded in 1911 by a group of Danish educators. Note that the name of the valley and the town of Santa Inez is spelled with a "z" while the mission is spelled with an "s."
Layout: Traditional quadrangle and neophyte housing area. Water Source: Both Alamo Pintado Creek and Zanja de Cota Creek passed through the mission lands and water was channeled via an elaborate system of canals into two stone-lined reservoirs, a lavender and mill complex. 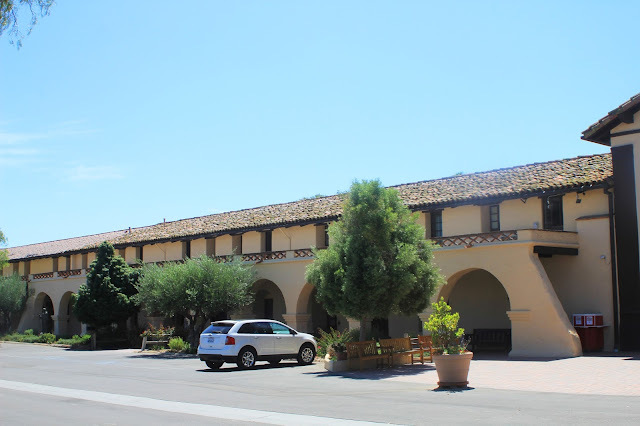 Population: The mission was established late in the mission era and only operated for 30 years. There were relatively few natives in the immediate area. The highest mission population was only 768 in 1815. Livestock: Santa Ines had a large and relatively stable livestock herd. 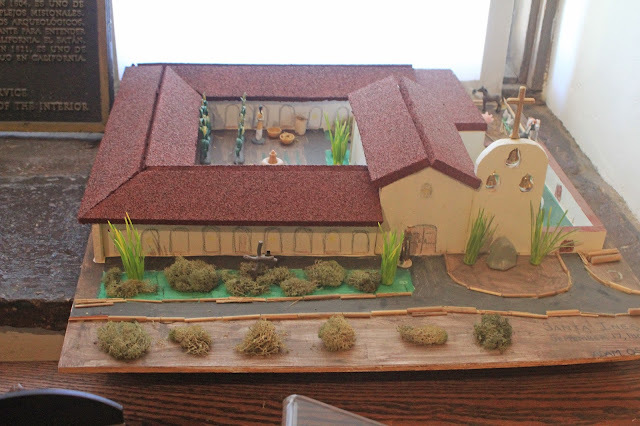 In 1832 the mission had 9,460 animals, including 7,000 cattle and 2,000 sheep. 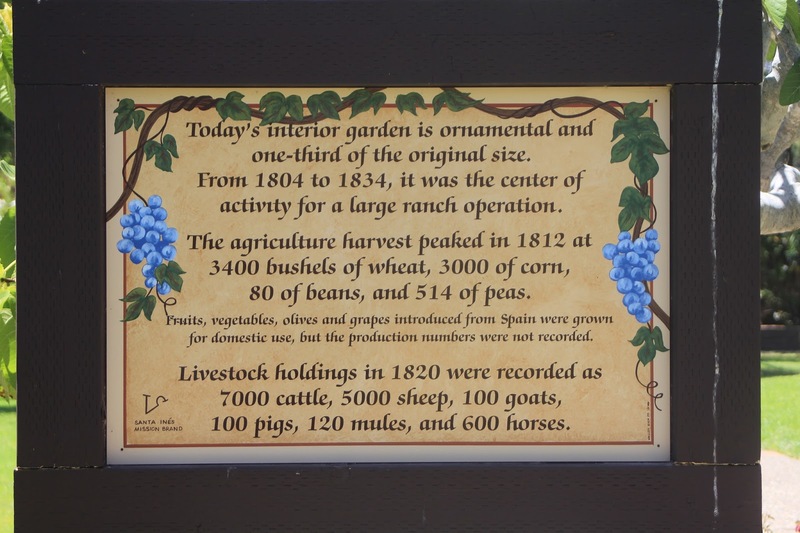 Agricultural Output: Over the years between 1804 and 1832 Santa Ines harvested over 121,000 bushels of wheat, barley, corn, beans, peas, lentils, garbanzos, and habas (broad beans). It had the second highest production of wheat in the entire chain. 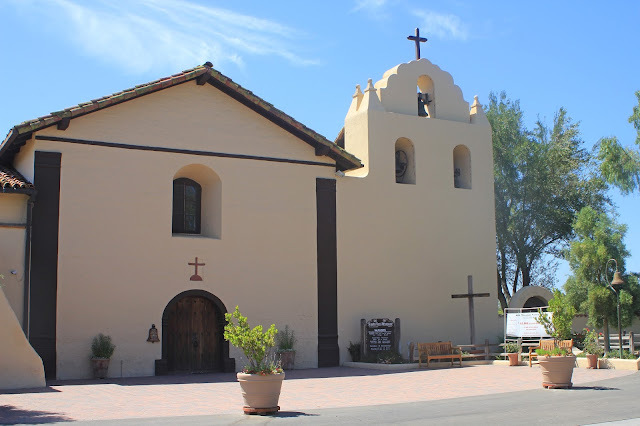 Mission Church: The current church, with its plain facade, dates to 1817. The interior was repainted with the current design in 1825 and the nave was recently embellished with additional floral motifs along the whole of its length. Mission Bells: The mission museum displays the bells of 1804, 1808 and 1818. 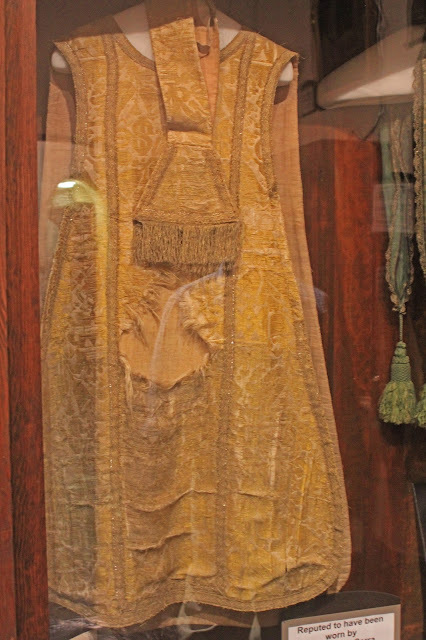 Mission Art: The mission is known for its extensive collection of church vestments, which date from the 17th century through 20th century and includes a Chasuble worn by Fr. Junipero Serra and a 17th century cape crafted in materials from the Court of Louis XIV of France. The impressive mission museum includes a painting of the Archangel Raphael rendered on canvas by an Inezeno or neophyte convert of Santa Ines. 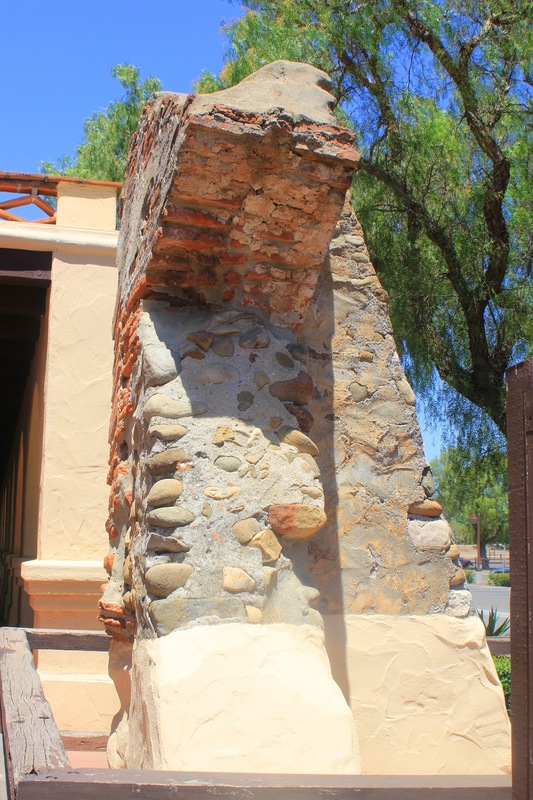 Special Attraction: In 1820 a grist mill fed by Zanja de Cota Creek was constructed about a half mile from the church. The mill system consisted of two large stone reservoirs, a stone mill building with a water propelled horizontal wheel and mill stone, and a network of zanjas or canals. A second (fulling) mill was added at the upper end of the large reservoir in 1821. The mill ruins are now owned by the California State Parks, with long-term plans to provide public access in a new State Park in Solvang. 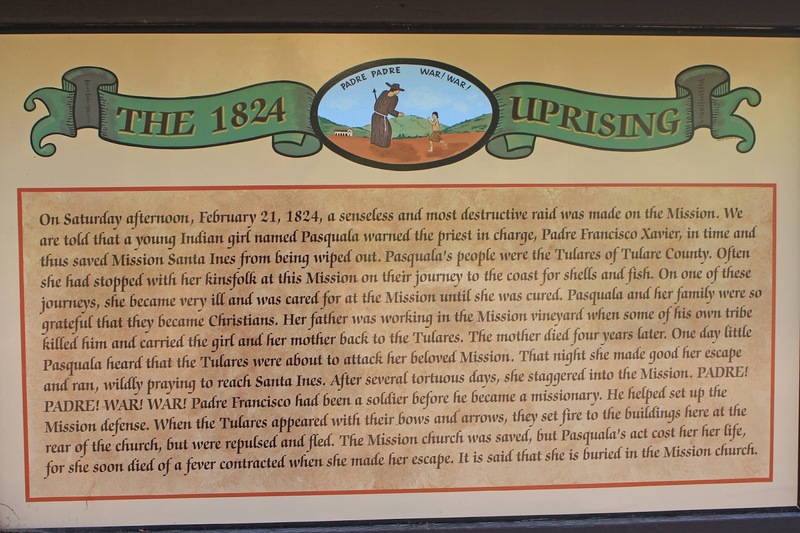 Significant Event: The largest Indian uprising in the mission era began at Santa Ines in 1824, triggered by the excessive beating of a neophyte by a soldier. Year Returned to Catholic Church: 1862 in a proclamation signed by Abraham Lincoln. Current Status: Active Roman Catholic Church of the Archdiocese of Los Angeles. 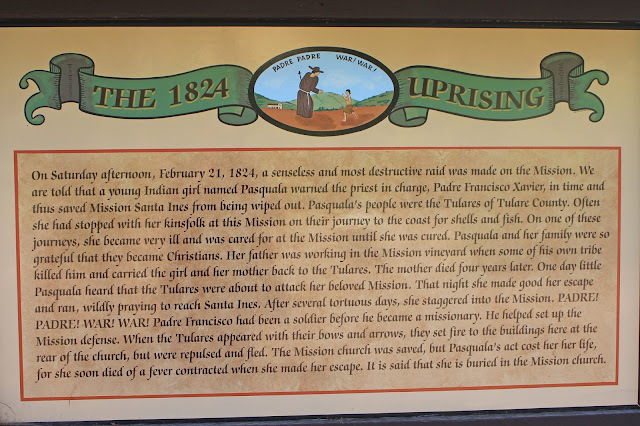 Interesting Facts: The mission served as a buffer against a hostile Indian group, the Tulares, who occupied the region to the northeast. 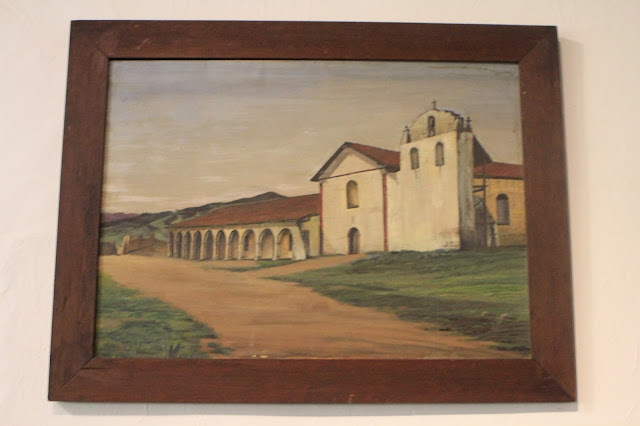 Santa Ines was never totally abandoned after secularization, and California's first seminary/college, Our Lady of Refuge, was built in 1844 on the mission grounds. 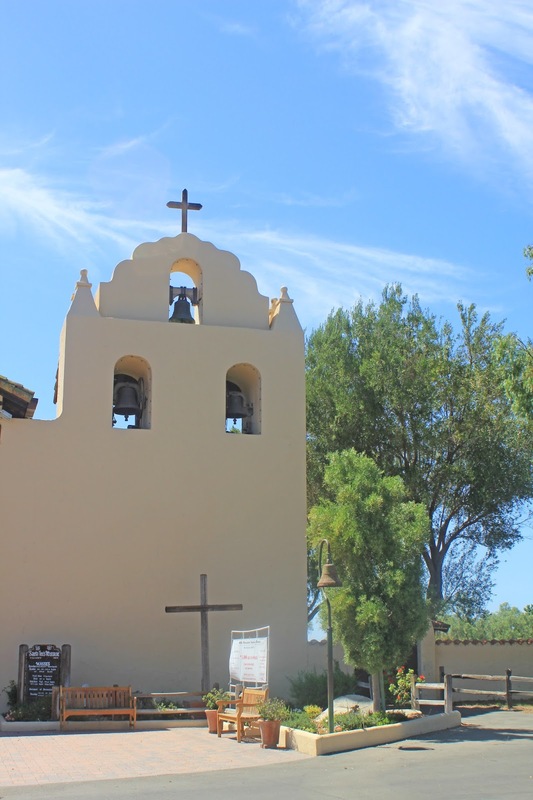 The mission companario collapsed in 1911 and was rebuilt with five bells. 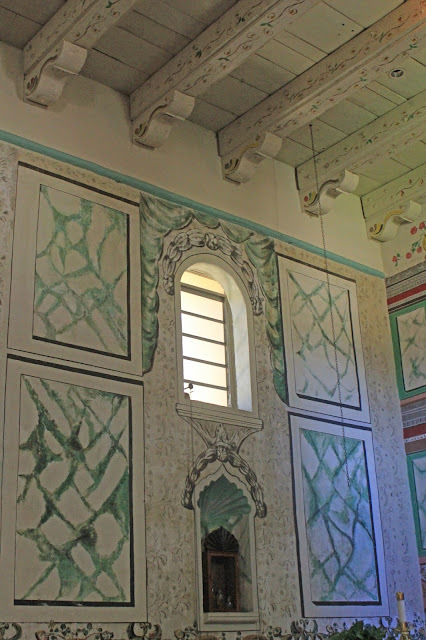 It was finally restored to its original design in 1947. Mamie Goblet, the nice of Father Alexander Buckler, devoted nearly 20 years (1904-1924) to the restoration of the vestments of Santa Ines.